The Travelling Lindfields: Perisher Valley, Skiing - 'Big Brother' Is Watching You? At Thredbo Alpine Village he can drive the car up to the lodge, park and unload outside the door, walk to restaurants and shops and stay in a self-contained apartment owned by our ski club. At Perisher he has to park the car 10 km away at Bullock's Flat, load our luggage onto the Alpine Railway, unload it all again at Perisher Valley terminal and then pay the equivalent of our combined weight in gold bars to have it transported by oversnow-cat to our communal club lodge. D doesn't cope well in shared accommodation. Our Perisher lodge is completely surrounded by snow. D doesn't cope well with being stranded in the middle of a snowfield. Heading out after a day's skiing for a quiet meal at a local restaurant is out of the question and the village shops are a long, hard trudge through the snow. I love it. The boys love it. David hates it. The Ski-tube Alpine Railway arriving at Bullock's Flat car park. All this luggage is ours - we really have to learn to travel light! Skiing at Thredbo is scary. The main runs are long, steep, narrow and famous for sheets of ice. When the wind picks up in the afternoons even the easy runs turn into minefields littered with large circular ice-patches, affectionately known as 'death cookies'. I am way out of my comfort zone the entire time. Skiing at Perisher is easy. The runs are wide, gentle and not famous for ice. Kamikaze skiers can seek out the black and double blacks but for wimps like me there are plenty of easy, scenic trails through the eucalypts. I am always within my comfort zone. When we were first married we joined a Ski Club. 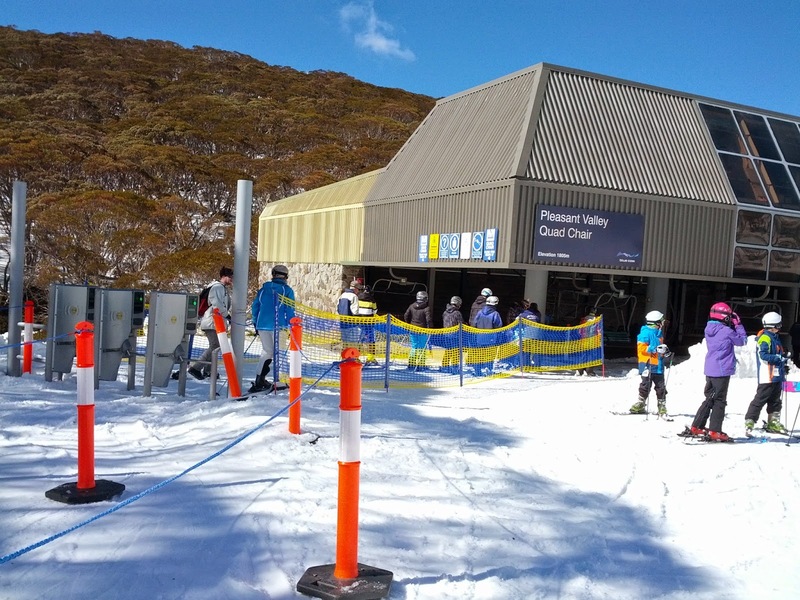 The club has lodges at both Thredbo and Perisher. Every year I try to persuade David to ski at Perisher and every year with only one or two exceptions I find myself standing, terrified, yet again at the top of Thredbo Mountain. This year however the planets aligned to bring us to Perisher in one of the best seasons the Snowy Mountains have seen in decades. Day 1: - The sun was out and the snow was perfect. We left the lodge at the very respectable hour of midday, skied across to Guthega Inn for lunch, took a few easy runs down Pleasant Valley Quad Chair and traversed back for an early evening in front of the fire. Day 2: - Another perfect blue sky day. We woke early, were among the first in the queue when the Interceptor Chair started at 9 a.m, caught the lift up feeling very virtuous only to discover that first thing in the morning even Perisher has ice and it is really better to sleep in until the sun softens the snow. After a couple of icy runs we took the Piper T- bar across to Smiggins Holes for a trip down memory lane exploring the slopes I learnt to ski on as a child. Day 3: - Yet another day of beautiful weather: But - today I realised that 'Big Brother' was watching - and I didn't like it. Back at the lodge in the evening of Day 2 I had discovered the Perisher Dashboard. The Dashboard is social media for skiers. It tracks what you have done and where you have been. Log on at the end of the day and you get access to your statistics - things like how many vertical metres you skied, which ski-lifts you took and how often you rode them. 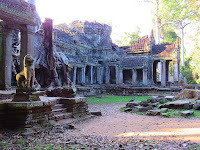 You can even check out 'Dashboard Pics" - shots taken by roving photographers. All this information is collected and collated by tracking your ski-pass ticket. 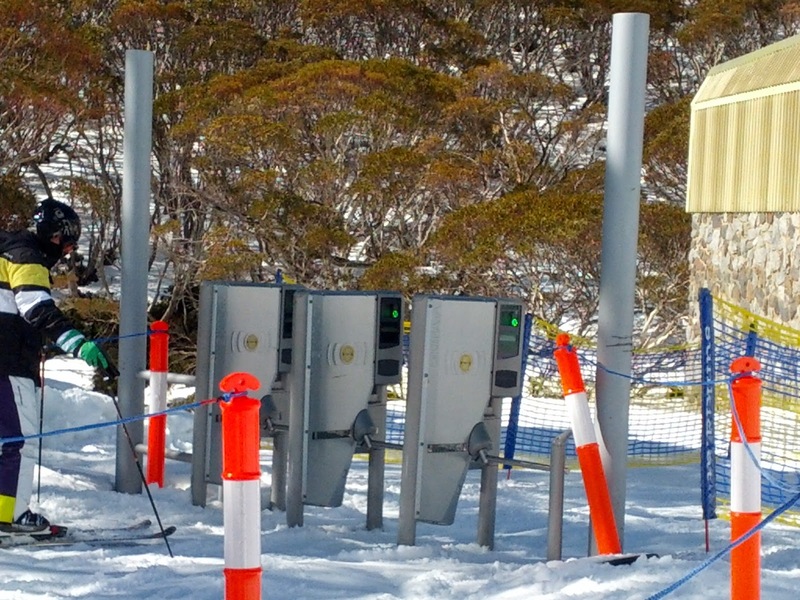 George Orwell's 1984 had nothing on Perisher Ski Resort. Almost every lift has electronic gates. As each skier goes through the gates his ski-pass is identified and his location is logged. The result is that at any time of the day Perisher Ski Resorts knows exactly where you are. 'Dashboard Pics' is even more Orwellian. Roving teams of photographers have sensors which can identify a skier by scanning their pass at several hundred metres. Ski past one and not only your location is logged but your photograph as well - or so I was told. I can see a few legitimate uses for this information. If a skier needs to be contacted in an emergency it's fairly easy to narrow down their location and if they fail to return at the end of the day the Ski Patrol know where to start looking, but the question is: Is this worth being tracked the entire time you are on the mountain? As someone who is paranoid about their own privacy (and yes I can see the irony in this statement coming from a blogger) I think the answer is a definite - no! Am I concerned enough about this to stop skiing at Perisher - Absolutely not! After all, Perisher may be David's worst nightmare but I just love the place. Pleasant Valley Quad Chair: - Notice the electronic gates on the left. A close up of the electronic gates. Looking out the back of the lodge. Note: Just in case you are wondering what happened to Days 4 to 7, the weather closed in on the morning of Day 4, the ski lifts went on 'wind-hold' and the forecast was for three days of snow, rain and high winds. David just couldn't cope with three days of being cooped up in a lodge surrounded by snow so we packed up our mountain of luggage and headed home. My Stats from the Perisher Dashboard. 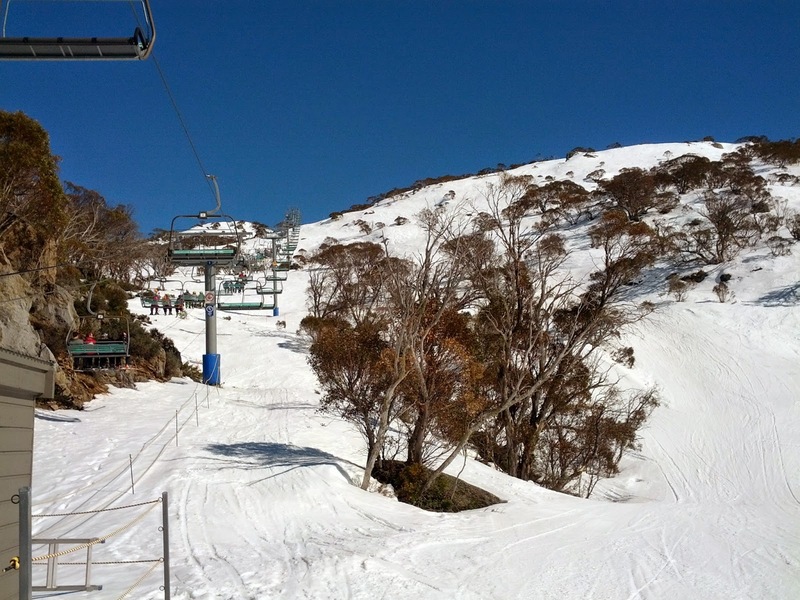 For my other posts on skiing including a guide to ski resorts in New South Wales - click here.